In its Dispatches program, Channel Four asks ‘Is Gordon Brown fit for purpose?’ The treatment by Peter Oborne purported to be a forensic analysis, demonstrating the dangers that might be brought to the country if Brown becomes the next Prime Minister. We compare the treatment to that offered by Adam Curtis in The Trap. Channel 4. Last night I switched on a Dispatches program which promised an informed perspective on the Labour party’s leadership. I missed the first few minutes of the broadcast, and found myself watching a somewhat agitated presenter breaking news of some pending disaster. Tone and worlds were slightly less apocalyptic than an Orson Welles announcing that the Martians had landed. No, I was watching the programme I had tuned in for. Perhaps the title indicated the line it would take: Gordon Brown: Fit for purpose? The intense presenter was celebrated journalist Peter Oborne. His thesis was, essentially, that the country faced the very real prospect of acquiring a pathologically flawed leader. Perhaps the title was a giveaway. It is a fine specimen of its kind. Arresting, disturbing, compelling the would-be viewer to tune in. Oborne, a favorite target for Private Eye, has in the past produced such pieces for Channel 4 as Why Politicians Can’t Tell The Truth (because they obsessively pander to the floating voter), and for the Evening Standard, Why the US is now our great enemy (because they ignore Global Warming). He has also done a piece on why Alistair Campbell has had a malign impact on politics (a view emotionally put by Michael Howard, face-to-face with Campbell, on Newsnight a few evenings ago). And a piece on why Robert Mugabe is a tyrant and what we should do about it. So Peter has a nose for a threat, preferably a big hairy threat of national or global scale. Nor can he be seen as a simplistic ranter. Although there is not much doubt that he does rant. Which makes his apparently rational approach rather interesting. His methodology is that of the scientist in search of the truth. His manner is that of those obsessive individuals whose behaviors frighten him into his own intense responses. Yes, the ‘evidence’ was presented in an apparently forensic style, assembled into a dossier, a diamond geezer dossier, the very opposite of a dodgy dossier. A hundred interviews were collected and codified in almost a parody of an even-handed style. At face-value the style insists on the balanced nature of its content. The balance is achieved by collecting lots of ‘evidence’ from interviews with those describing Brown’s inappropriate and dysfunctional behaviors, and from time to time cuts from a fewer number of interviews with another group of people largely lumped together as an inner-circle for whom Gordon can neither speak nor do wrong. The credibility of these witnesses was reinforced by their lucidity, and restraint. Yes, these were mostly credible statements, honestly reported. So what can be wrong with that? Perhaps, to extend the forensic metaphor, because these were mostly the usual suspects. We could more or less anticipate what Clare Short would say. To present her as a key witness suggested that there was no more balanced view available. 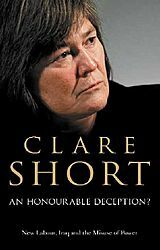 Claire offered the comfort of repeating, mutatis mutandis, what she has been saying since her resignation from Government, over the duplicity and ineptness of Tony Blair. The program had something of The Trap about it, another recent and well-crafted polemic disguised as a piece of good old fashioned investigative journalism. But Adam Curtis drew on a richer mix of post-modern devices, and had more layers of ambiguity compelling viewers to stay with it. Oborne, could be accused along with Curtis of indulging in what Guardian critic Oliver Burkeman called conceptual long-jumping. My suspicions had been thoroughly aroused by the time the docu-rant reached an episode in which Gordon Brown was presented as being very brusque and rude at an EEC meeting. It seems that he ignored the views of others and simply repeated his position. This was presented as further evidence of his personality defects and a style which makes him unfit for office. ‘What about Maggie!’ I shouted. But due to the nature of television, Oborne ignored me. And he never made the next step in the argument. Could we take the case of Margaret Thatcher’s dysfuntional style as even more evidence that Gordon just doesn’t have what it takes to be a good political leader? Or am I engaged in a ridiculous piece of conceptual long-jumping? Overall, a profile of Gordon Brown is emerging. He undoubtedly has displayed many of the less pleasant characteristics of powerful leaders in politics, business and sporting domains. If I understand the thesis, Australian commentator Jeff Schindler [aka Jeff Schubert] would have us believe that given more power, Gordon is likely to become more rather than less autocratic. Oborne may have a point. But it is neither new, nor particularly damaging. I am reminded of something I overheard in a discussion between two colleagues, a few years ago. The one had arrived at the conclusion that Tony Benn was a dangerous and mad politician. He had expressed this to someone with Bennite sympathies. ‘He’s got big staring eyes’ the anti-Benn character asserted. ‘He’s mad, that politician’. Or, to deploy another bar-room maxim, it takes one to tell one. Which might not be terribly balanced, but still seems somewhat relevant to Oborne’s treatment of Brown’s state of mind. You are currently browsing the archives for the Peter Oborne category.